WINNIPEG — Before Friday night, the last time the Jets lost three consecutive games in regulation was March ... of 2017. The Jets didn’t drop three games in a row this entire season because to hear Paul Maurice explain it, there were no extremes to their game. There was no rollercoaster. Winnipeg has waded into unfamiliar territory, they are in the deep end of the pool now. Their Stanley Cup dreams are on the brink of becoming a nightmare. They beat the President’s Trophy-winning Nashville Predators, the team their season was geared around, but may go down against the Vegas Golden Knights thinking they’ve been the better team. That is exactly what Maurice is saying and feeling now. 1. TRUSTING THE PROCESS: Tyler Myers said the Jets have been “the much better team” over the last five periods. Blake Wheeler said the Jets win Game 4 “nine out of 10 times.” The fallacy is in thinking that the same process will produce a new result. 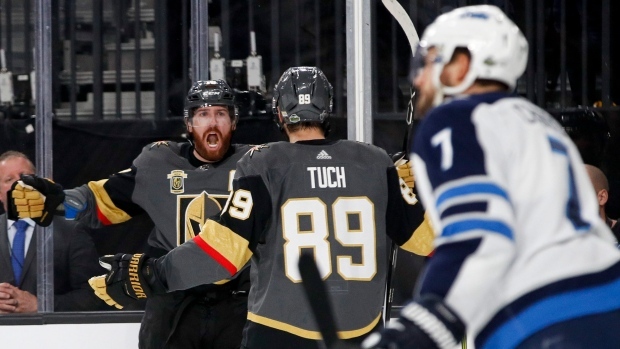 Yes, the Jets owned an overwhelming advantage in offensive zone time, but that doesn’t count the amount of time the Golden Knights have spent celebrating. A deeper dive shows that the numbers don’t exactly match the eye test. High-danger scoring chances were close at 17-12, according to NaturalStatTrick.com. More than that, Mike Kelly at The Point pointed out that the Golden Knights have outshot the Jets, 34-30, from the slot over the last five periods in addition to outscoring them by a 6-4 margin. Vegas also created 22 scoring chances off the rush compared to Winnipeg’s 13, according to The Point. The Golden Knights should be credited for how well they’ve defended. 2. OUT-GOALTENDED: A confident, if not cocky, Connor Hellebuyck said after Game 4 that the “stars have aligned” for the Vegas Golden Knights “but it’s not going to stay that way.” There is little evidence to support Hellebuyck’s claim. He has been significantly outplayed by counterpart Marc-Andre Fleury. “They’re one-goal games, so that feels like the difference,” Maurice said of the goaltending. Through four games, Fleury owns a .930 save percentage, while Hellebuyck is hovering at .897. It hasn’t just been the goals that he’s given up, but also the timing of them. The 137 combined seconds between four response goals from Vegas have been the difference in the series. Hellebuyck was directly responsible for two of those backbreakers when he bobbled the puck behind the net. When the Jets desperately needed a stop, when Reilly Smith was on a breakaway, Hellebuyck was beaten short-side. 3. SLOPPY TURNOVERS: Whether it’s behind the net or at the blue line, the Jets have not slowed the spigot of egregious turnovers. From Toby Enstrom and Dustin Byfuglien to Mark Scheifele and Patrik Laine, there are few innocent parties on the Jets’ roster. They may seem uncharacteristic, but part of that is the pressure that the Jets have been under because of the speed of the Golden Knights. The Jets can skate with them, but they haven’t moved the puck clean enough or quickly enough. Maurice said the focus won’t be on the Jets’ mistakes, not with the season on the line. Their impact is obvious, the time has come to turn the page on the turnovers.